Fikri Jermadi remembers a football CD making its way around some years ago about a part of football in Malaysia, and looked it up again. The above quote is by the great Santokh Singh, one of the key members of the all-conquering Malaysian team of the 70s and early 80s. This documentary, however, is not about that. In many respects, it is not even really about football. There are a number of reasons for this. 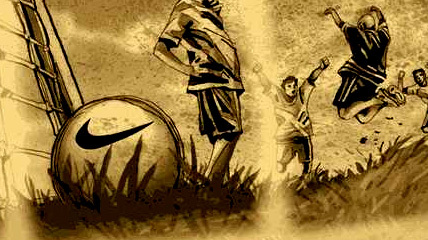 The first is the usage of football as a medium through which an even bigger message is hinted at. There’s no real preaching here, but through this documentary we get a slice of life of those who are deeply in love with football. At least, if you can call it that. The second reason why I am keen to consider this further is because the majority of the people featured in the film are not really playing football, per se. The more specific and accurate term may be futsal. Look it up on Wikipedia, and you’ll find it described as “a variant of association football that is played on a smaller field and mainly played indoors.” Many may well disagree, and with good reason, but for me the distinctions are strong enough to render them different sports, even if they are identical in some regards. It does not, however, make this any less of a film. 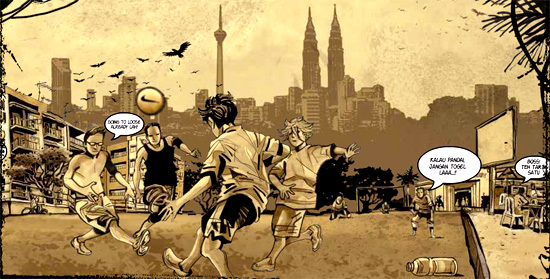 Produced seven years ago in time for the Asian Cup (which Malaysia co-hosted), it is actually part-documentary, part-promotional effort by Nike Malaysia. This is another important factor to consider. Initially starting life as a series of comic strips, it was expanded to become and include this short documentary. I remember it was passed around in small DVD (or was it VCD?) envelopes, not the same as the hard DVD cases. That was the first time I watched it, having popped in the disc without truly knowing what to expect. This may explain the title, which is one of the more eye-catching aspects of this film. 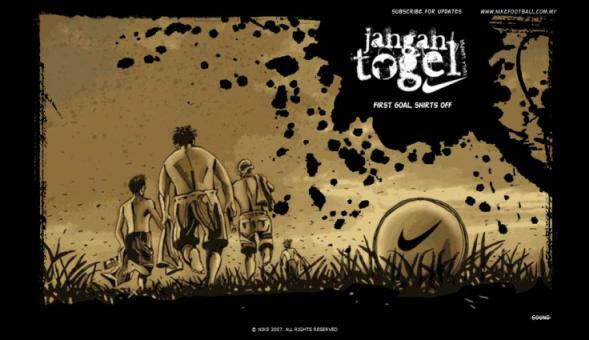 ‘Jangan Togel’ might, at first glance, make people wonder why Nike would make a documentary encouraging people to keep their clothes on. They would only be half right, for togel (at least in the context of this documentary) means being half-naked, or losing your shirt. The similarity to bogel aside, not wearing your shirt on the football field is akin to admitting you’re second best. More research reveals a deeper connection between the word togel and lottery, so perhaps Nike intends this as missive against gambling. Given that it’s Malaysian football we’re banging on about, it’s unfortunately not entirely irrelevant. Look at all this mudness! All jokes aside, I have to admit to coming across very little information that could validate this supposed tradition of togel. I have indeed seen people play football without their shirts on, but two primary reasons I can educt from that is: a) it helps to identify who are your teammates, given that public games can be a mish mash of who’s who from wherever; you’ll never remember who to pass to otherwise, and b) it’s more fun. Go on, try it. Let the skies open and the rains fall, and start sliding around on the muddy fields to your heart’s content. As such, I honestly don’t know whether the term itself existed natively, or whether it was an attempt by Nike to create a certain brand from the grassroots level. Of course, I am greatly lacking in knowledge about football at that level, so if someone could correct me, I would welcome it. The promomentary (if I may be permitted to name it as such) features different teams from different areas. One, the Red Galacticos, is a proper futsal team, with regularly arranged training sessions and such. The remaining two are from Prima Selayang and Kampung Pandan, who do not have their own Facebook pages and are not celebrating their 10 year anniversary. The action was very comical. Literally. I mention that to distinguish between the first and the latter teams. This is important, because it is an indication of the impact of the game on fairly different groups of people. The renting of futsal pitches is not a cheap thing, so for someone to do it on a regular basis it is a strong hint of their collective economic power. We don’t get to follow much of the Red Galacticos beyond the futsal pitch to truly confirm this, but that was the impression I got. This is the most interesting part for me, as we see how football becomes a release for the less privileged. Many of the world’s greatest footballers have often channeled such external factors to further drive their success in the sport. 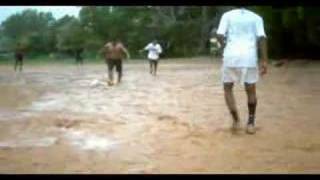 This documentary, intentionally or otherwise, highlights the escape valve football is from the dreary banality of day-to-day life. I am also impressed by the actual aesthetics of the documentary itself, which can’t have been difficult to shoot and edit. The film is essentially composed of a number of shots of the city, a bunch of talking heads, and the boys themselves in action. The talking heads can be very interesting. One of them is with a mother of the one of the boys, who talked about how her son played so much football, even indoors, to the point of breaking flower vases in the house. I couldn’t help but laugh at that, a small window that shows the innocence of quite a number of the boys. I must thank the film’s director and cinematographer, Kubhaer T. Jethwani and Adam Lokman, for their skill in capturing this innocence. It’s not all that easy to do. A number of them expressed a desire to even pull on the yellow and black jersey of the Malaysian national team. Which made me wonder: how many of them actually made it? Professional football (and futsal) is a tricky proposition, especially in a fairly conservative Asian society like Malaysia, which does not allow for many to break outside of the box. I did a brief Google search for each of the names that came up at the end of the documentary, wondering if any of them actually did make it to the top, so to speak. One of them, Azlan Hateem Abdullah, apparently represented the Malaysian Amateur All Stars against Shah United of Brunei some years ago in a futsal match, while Alvin Chew Zhen Ming even played at Wembley a couple of years ago. That appears to be for the distributor of Budweiser, Luen Heng F&B, in what must be a corporate event arranged for by Carlsberg, so I don’t know whether that counts. The most successful appears to be Qaiser Heshaam, who has pulled on the famous yellow and black jersey of Malaysia 68 times (and counting). He is currently representing the Malaysian futsal team, and was selected for the 2014 AFC Futsal Championship, which was held in Vietnam just last month. They didn’t do all that well, though, finishing bottom of their group on goal difference, but it was a pleasant discovery to make all the same. Dreams really do come true…at least in some ways for some. Fikri nearly always got picked last for football.